We have reserved a room allotment at the Maritim Hotel Nuremberg. Please note that the cost of accommodation does not form part of the registration fee. You are therefore at liberty to look for other accommodation nearby, if you prefer. Please note that you will be forwarded to the booking platform after completion of your registration. The comfortably furnished 20 sqm Classic rooms can be found on the first and second floor of the Maritim Hotel Nürnberg. 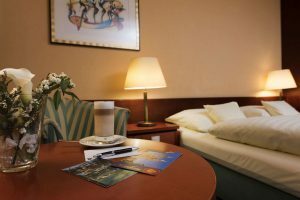 The rooms are equipped with flat-screen TVs and free Wi-Fi, as well as a minibar and an in-room safe for storing your valuables during your stay in Nuremberg. Located slightly more peacefully on the third to seventh floors, these 20 sqm rooms are furnished with every comfort in mind. Our Comfort rooms either face out over Nuremberg Altstadt (old town), or overlook the inner courtyard of the hotel. Each room comes with a flat-screen TV, a free Wi-Fi connection, an in-room safe, and a minibar stocked with refreshing, cold beverages.